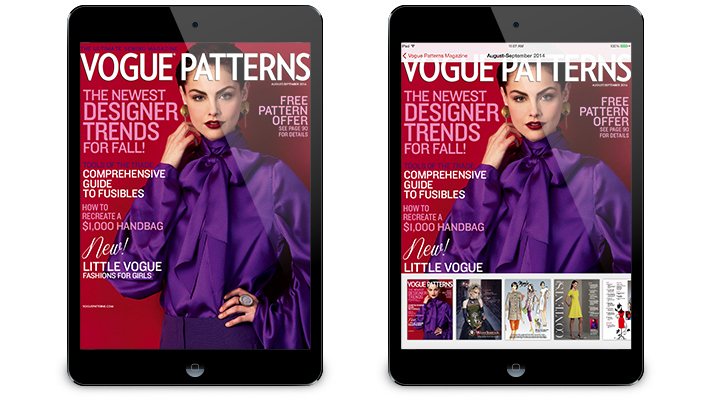 DPCI implemented the Baker Framework on behalf of McCall Pattern Company to distribute the digital edition of Vogue Patterns Magazine to the Apple iOS platform. The McCall Pattern Company founded in 1870, is a privately-owned, worldwide company that designs, manufactures, markets, distributes and sells sewing patterns and instructions for women's, men's and children's fashions, accessories, costumes, crafts and home décor. The McCall Pattern Company was looking to expand readership and subscriptions to its consumer magazine, Vogue Patterns, by distributing the magazine in digital format, specifically to tablet devices. The company hoped to gain more exposure for Vogue Patterns while also offering complimentary digital subscriptions to current print subscribers. The McCall Pattern Company sought to find a digital publishing solution that would provide existing magazine staff with a repeatable content creation process to quickly deliver an interactive version of the print magazine to tablet. Management retained DPCI to help define a digital content strategy to meet the company’s digital publishing goals. At the conclusion of the strategic consult, DPCI submitted a comprehensive report that documented the strengths and challenges of the current state. In this report, DPCI identified process and technology improvements that would enable the McCall Pattern Company to meet its multi-channel publishing goals. After careful consideration, the company hired DPCI to implement the Baker Framework, an open source HTML5 based framework intended to help companies distribute digital publications to the Apple iOS platform using simple open web standards. Although the Baker Framework was a great start, the company had a few unique requirements that were not met with the out of box functionality. One of DPCI’s primary goals was to customize the Baker Framework to include a login within the application to entitle print subscribers to digital editions with out requiring repurchasing of the issues. 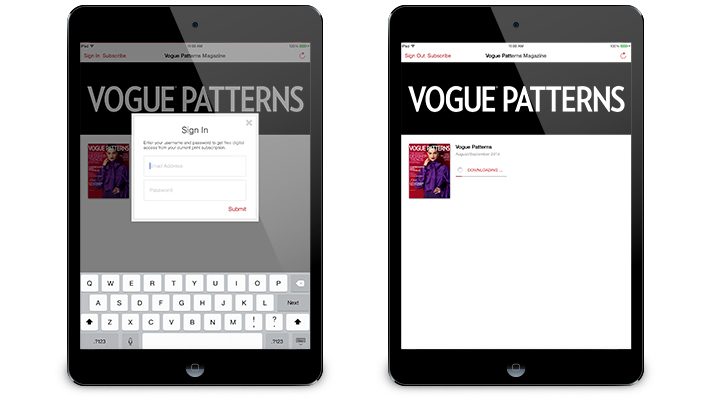 DPCI implemented an iOS app for Vogue Patterns magazine using the Baker Framework and In5, a third party plug-in for Adobe InDesign that exports InDesign content into the .hpub format for the Baker Framework app. First, DPCI installed the Baker Cloud Console and configured the Vogue Patterns publication. 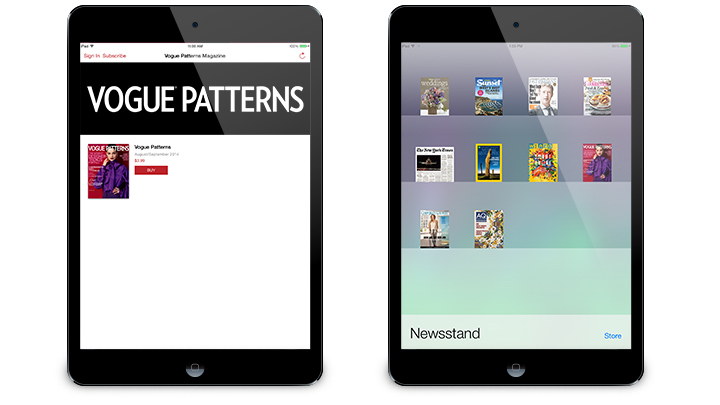 Then using the Baker Framework, DPCI created the newsstand enabled iOS app to meet the unique requirements for Vogue Patterns. DPCI customized the Baker Framework iOS app to include a sign in form to capture user credentials and authorize the download of entitled issues within the application. Then DPCI enhanced the Baker Framework API to connect with the company’s subscription database so that content is delivered to authenticated users based on their subscription status. DPCI guided the staff members through the end-to-end process for creating and publishing the app including use of the Baker Cloud Console for publication management and iTunes Connect for creation and management of the App in the Apple App Store. Prior to submitting the apps for approval, DPCI conducted quality assurance and performance testing to confirm that all content functioned properly on the intended devices. With DPCI’s help, the McCall Pattern Company launched the Vogue Patterns magazine app in the Apple App Store in August 2014. DPCI continues to support the McCall Pattern Company’s implementation of the Baker Framework for the Vogue Patterns iOS application and digital editions of the bi-monthly publication. "McCall recognized that a digital edition of Vogue Patterns magazine would provide an opportunity to increase and retain our subscriber base but our staff had no experience in this area," said Kathy Marrone, Editor in Chief, Vogue Patterns magazine. "DPCI offered a number of solutions that fit our existing workflow. DPCI prototyped and rolled out an iOS version of our magazine and worked with our team to integrate this into our editorial and production processes. With DPCI’s help, we hope to expand this into the Android platform by the end of 2015. We have come to rely on DPCI’s judgment and expertise. They have become a valuable resource and an important extension of our team."